Try Rolf Unternaehrer RV6 Builder and A&P. I know he does quite a few condition inspections. It all depends on weather for me. If weather is good there will be two of us. Looking for Reasonable Good Panel Builder to Upgrade my Ratty RV9 panel. When you install one Surefly your magneto is the backup. If you install two then a battery back up is needed. Easy install, excellent factory support, No glitches with operation. Noticeable fuel consumption decrease. Ive used The Velocity Shop in El Reno OK for over 10 years now. I wanted a little extra range so I got some 6' tank skins from John Harmon (don't know if he makes them anymore) I then cut them back so I had one extra bay. Fuel tank sloshing SB outsourcing or tips? Large oval holes will make access a lot easier. I believe Chief has exactly the same instruments without the RV logo on them. Fairings Etc's. upper gear leg fairings index Van's gear leg fairings so no strings and plum bobs. RV-Super 6 Hawk Strike during Reno Races...and the repairs! If F6 isn't too badly bent you may be able to just leave in place and tweak it a bit. It is pretty flimsy before installed and the aft baggage compartment panels hold it in shape. They are all over your area. There are a few at Gnoss, Sonoma sky Park, Petaluma and a bunch in Santa Rosa. Where do you go for your TFR's? 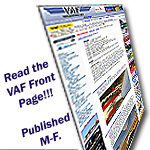 Try VAF's TFR site. Eight show up in CO. If you are on a budget then just put a list on VAF of what you need, especially the big items. Quite often I see DRDT-2's on here at a bargan price. The only thing that people are intimidated with is application if sealant and riveting it together. Dave is referring to worn valve guides that allow excess oil through. I believe that your oil consumption is at the lower end of Lyc's acceptable range for oil consumption but still OK. I have the 6 cyl version. I can run a lot more leaner. To kill the engine I have to pull the mixture out noticeably further. I have an IO 540 C4B5 on my RV. Type of Lyc shouldn't make a difference. I had 3000 RPM's overspeeds at full RPM's and fluctuations at lower RPM's. The steps I took to remedy the problem. Dame experience as Walt and Scott. Just don't tighten more than spec. I have one on my 6 cylinder Lyc. Fuel Flow Transducer going bad? I know that fairings Etc's lower fairings for a 6/7/9 will fit a 4. The 4 has a unique fit and upper fairings will not work. Fairings Etc has a specific fairing for the upper. 2nd annual RV fly in Benton Airpark ( O85 )Redding, Ca. This lot has lots of trees, and eucalyptus trees too to make you feel at home. Demo Ride at Osh this year? Would love to do an adventure like that. Thank You Mark for the update. There MAY be a difference in fuel pump types and slightly different type magneto. Would this be a trip from UK to California? Gary Hunter wheel pants & fairings ?? I wonder how many RPM's the engine turned. New RV-4 Build; Ancient but Gotta Be Done. Everybody at Petaluma knows Rolf U. He has done quite a few condition inspections as well as built his own RV6. He is thorough. I have used taper pins. Requires a special drill and hold very tight. I have nearly an identical set up. unpaved or backcountry airstrips in Norcal? It is long and gravel. Target practice on one end and boating on the other. They have built 100's of regular and high performance engines for years. See if you can add a little vacuum to it. 1/2 psi not the full brunt of a shop vac. So far it looks like rain here on Sat. We got rained out last year too. If the forecast changes for the good we will be there. He is reasonable and experienced. RV-4 gear length - long or short ?? On a perfect three point landing with longer gear legs, the wing has a higher angle of attack which in my case equated to more lift.